I hope August is treating you well so far! I’m back with another income report, and I want to thank you all so much for the support and encouragement you showed me after sharing my first ever income report last month. July was a great month for me and I’m excited to be able to share my progress and lessons I’ve learned this past month. In addition to sharing my blog income, I decided to start sharing my blog traffic and expenses as well. I think it is a crucial piece of information that can be very helpful in seeing how everything is intertwined and how income and traffic are related. The income below is for money earned during the month of July but not necessarily paid out during the month of July. It’s also important to keep in mind that these numbers do not reflect the taxes I will need to pay on this income. Since I’ve yet to share any traffic statistics here (woohoo for a first! ), I’m just going to share all of my page views from every month since I started this blog so you can see the progression for yourself. I thought that my blog traffic was totally tanking in the beginning of July, but now I believe it was just related to the 4th of July holiday because after that first week I definitely saw a spike in traffic. I’ve heard that summer can be very slow for a lot of bloggers, so I was encouraged seeing growth in my own blog. I think that the growth during summer is mostly due to the fact that I’m still a relatively new blogger and not yet established, so I would probably expect to see traffic slow down during summertime in the coming years. I’m very happy with this upward progression in both traffic and income! I did learn quite a few lessons this month though and it’s been a very humbling experience. I’ll share more on that below. I made the leap this month and decided to invest in Board Booster, which is a scheduling tool for Pinterest. I have to say that this has been one of the best decisions I’ve made since I started my blog. I had been spending typically 20-30 minutes every single day of the week (Saturdays and Sundays included) pinning my pins to various group boards, and it was getting downright exhausting. And since around 60% of my total blog traffic comes directly from Pinterest, I definitely couldn’t give up on pinning alltogether! I made the decision in early July to finally sign up for Board Booster, and it has been nothing short of amazing. I found the initial setup required to get all my boards up and running to take a bit of time, but now I literally don’t have to do anything to keep up with it. It’s the ultimate set-and-forget scheduling tool and I couldn’t recommend it more for promoting your blog posts on Pinterest! One thing I am really kicking myself for is that early in July I accidentally removed one of my top earning ads and didn’t realize it until several days had gone by. I logged into my Adsense account just to check on things and saw a dramatic drop in my earnings that wasn’t typical of a normal variation. I realized that I had been playing around with placement of a few things near that ad and accidentally deleted the code for it, ugh! So as a result, I lost out on almost a week of earnings from that particular ad. In the big scheme of things, it’s really not a huge deal, but I was pretty bummed out that I did that without even realizing it. Oh well, you live and you learn right? Lesson to be learned – double check all your ads if you make any changes within the general area they are placed! I also made the mistake of not properly installing Google Analytics until the very end of June. What a mistake! I now have to rely on JetPack for all of my statistics for most of the life of my blog, and many brands require you to show Google Analytics screenshots in order to work with them so that’s been not so fun for me to have to pass up opportunities just because of that. If you haven’t already installed Google Analytics on your own blog, please do it right now! I want to save you the trouble that I’ve been going through in not having the proper statistics source. I finally created a newsletter through Mail Chimp and now offer free printables that I created for subscribers. It took me quite some time to figure out how the heck to set everything up to get the printables delivered to subscribers after they confirmed their subscription, but I’m really happy I did it. You can subscribe here if you’d like to see what I’m talking about! I decided that I’m going to start a newsletter just for my fantastic blogger friends (that’s you). This is something different from my other newsletter I mentioned above, as it’s going to be completely dedicated to discussing all things blogging. I haven’t quite decided on the frequency of these newsletters yet, but it will likely be a monthly newsletter that will follow my income report and will provide a more in-depth analysis of what I learned the past month, as well as tips and tricks that I’d like to pass onto my fellow bloggers. You can sign up below if you are interested in receiving blogging tips from yours truly! And let me know in the comments below what topic you’d like me to cover first. If you are interested in submitting a guest post to be featured on Embracing Simple, I’d love to have you. You can find my guest post guidelines here. Amazing! You are totally rocking it Christina 🙂 To be at 66K page views per months after blogging for only 6 months is really high. 🙂 Ha. I feel the same way. Please don’t laugh, but once of my happiest moments blogging wise was when someone pinned my OWN post on their pinterest board for the first time or when I saw that I had 5 ‘real time’ visitors at the same time (per google analytics). I was about to faint. I am far behind you since unfortunately after 10-11 hours in office I don’t have as much time for writing as I wish. But for now it is a great outlet for me, for whatever it is. Haha <-- okay, despite this, I am not laughing AT you. I'm laughing because I felt the exact same way when I saw the same thing! I remember when I got to the 100 visitors total mark (as in the history of my blog) and I thought that was so cool! That's all that matters then, is that you enjoy the time you do get to spend on it! Great job on your July blog income! That’s how it all starts! Thank you Holly! It was pretty neat to be over $100 this month and to be able to justify taking on monthly blog expenses now. Thanks for serving as such an inspiration to me! This is my first visit to your blog and I’m very happy to be here. You really have a nice looking blog and i love all your doing here, its really simple as your domain name says. I can also see you’re gradually climbing the ladder of success and i want to use this opportunity and wish you more ground breaking months. I’m sure your August income and traffic report will be much more than the previous months. Just keep on eating that Frog. Finally, if you’re really serious about email marketing, I’ll suggest you go with Getresponse or Active Campaign. Getresponse will charge you about $15/month for your first 1000 subscribers will Active Campaign will charge you i think $10/month for your first 500 but over all, both services are awesome. You have a limit to what you can do with MailChimp. Thanks for sharing and yes, i will soon submit my Guest Post :). Aw thank you so much for the kind words and encouragement Theodore! I also appreciate the email marketing tips. I’ve used AWeber, Constant Contact, and a few other email providers for some of my clients, but I just personally prefer MailChimp for my own use. I might upgrade someday, but for right now it’s fitting all my needs. I’ll have to keep these other programs in mind for the future. Thanks again! Wow – impressive viewership! I’d love to learn more about how you use Pinterest to drive traffic. I’m just getting into Pinterest and think it can be a great tool, but I don’t quite understand the ins and outs of it yet. Wow that’s really great! 66k views in a month after 6 months of blogging is a great accomplish. What are your goals for the future? 100k monthly views by year end? Any strategies to increase page views? Thank you Erik! You know, I haven’t really thought about page view goals. I DO have a goal that I’d like to create my own product to sell by my 1 year mark in January. I’m not quite sure what that would look like at this point because I have too many ideas for that (what a problem, right? 🙂 ). But 100K monthly views by my 1 year mark would be amazing, I would love that! My main strategy at this point has been to create friendships with other bloggers (it’s not only beneficial for everyone involved, but is just plain old fun too!) and absolutely Pinterest. If you do nothing else, tackle promoting your posts on Pinterest. Thanks again! Thank you DC! Wow, that really says a lot coming from you 🙂 I appreciate it! Absolutely get Board Booster, it will be one of the best things you can do for your blog. Your posts would do great on Pinterest with the help of BB! I would be honored to show you how to set the freebie distribution up! Definitely reach out once you create something, I’d love to help!! Awesome job, Christina! It’s so great to see a little inside scoop on your blogging journey. I’m definitely signing up for your newsletter– I just started mine as well in case your interested! We should definitely swap ideas! Aw thanks Lauren! I’m excited to be joining as well, it sounds like so much fun! Haha don’t be deceived, I did not take this photo. It’s a free stock photo from Ashley Ella Design :). I am a terrible photographer, but that’s why I’m so excited about this month’s blog hop challenge. I’m breaking out of my comfort zone for it, and that’s always a good thing! I love Board Booster! It is so worth it. You’re right – takes a little time setting up, but it’s set it and forget it after that. I’m glad to see you’re seeing an increase of income – gives me hope! Thanks so much for sharing, can’t wait to receive your newsletter. You are doing an awesome job. I love your blog! I honestly have no idea Reelika! I didn’t have anything big happen in that time frame or try anything different. It would make sense if that increase was experienced from June to July since I started using Board Booster in July, but I’m really not quite sure what happened. I wish I had a solid answer or something specific I did to share, but I think it was just pure organic growth during that time. Thanks so much! OMG Christina you are AMAZING!!!! Your traffic is insane and you totally deserve it!!!! I am so happy to not only be following along, but to also have you as a friend 🙂 Keep up the great work!!! I couldn’t be more excited for you!!! PS I’m totally signing up for Board Booster now (through your link!). I was using ViralRoot which is OK, however…you do have to schedule everything out and it does take time, haha. Thank you again for using my link! Woohoo for $5 off my Board Booster cost next month. I so appreciate the support!! Thank you Janeen! I cannot believe it either….I actually tried Tailwind out a few months ago but it just wasn’t for me. I found myself still needing to spend almost as much time scheduling everything as I would just organically pinning (probably user error in my case and the fact that I have so many group boards because I blog about a lot of different topics), so I didn’t think it was worth spending money on, so I kind of gave up on the Pinterest scheduling tools until I ran across Board Booster and then fell in love! Awesome job on the blog income Christina!! I just signed up for the newsletter 🙂 and I definitely need to get on Board Booster like yesterday. It’s so refreshing to see the progress that 6 months in. Thanks for sharing. I’ve learned a lot already. You go, girl! Get those analytics up and running, learn from my mistake. Haha! Thanks so much Mary! Thank you very much Kay! You continue to be my #1 commenter and supporter, and for that I am truly grateful! 🙂 Thanks for always being encouraging and uplifting to me! Congrats on more than tripling your income. That’s amazing and super inspiring. But even more than that, your traffic numbers are really impressive, and you have such an engaged community. You’re obviously doing something right!!! Whoohee, that’s a big jump in views. Congrats! I don’t think a lot of my posts are pin-worthy, just because I talk so much about non-PF stuff. But I should still figure out how to make Pinterest-worthy images and look into the whole thing. Any day now. Thank you Abigail! I wouldn’t let that hold you back from making pin-worthy images, I would say that more than 50% of my posts aren’t related to personal finance, and some of those seem to be my most “popular” on Pinterest. Definitely figure it out, and let me know if you need help at all with that. Happy to answer any questions! I just started my blog. Although I’m not in to earn an income, I get inspired by reading income reports as well. Especially since I’ve read some blogs that didn’t earn anything for 2 years! Sounds like you are off to a great start! That’s awesome Shirria, welcome to the blogging community! I didn’t necessarily start out wanting to earn an income either, this was just a really fun outlet and productive for me and it blossomed into me eventually deciding to just up and install ads one month. Even if you don’t want to earn an income, there’s so many other benefits of blogging 🙂 The community and engagement being the best one of all! Wow! That’s an amazing upswing in traffic. Keep doing what you’re doing – It obviously works! I’m curious to know which article went viral…? I’m only just getting my head around Pinterest. Kind of. So I’ll definitely check out Board Booster. Hopefully August will be even more successful for you. Definitely check out Board Booster, it’s worth considering! I’m so excited I found your blog! I just started in July and still feel overwhelmed. I am so glad to see your stats since you started! 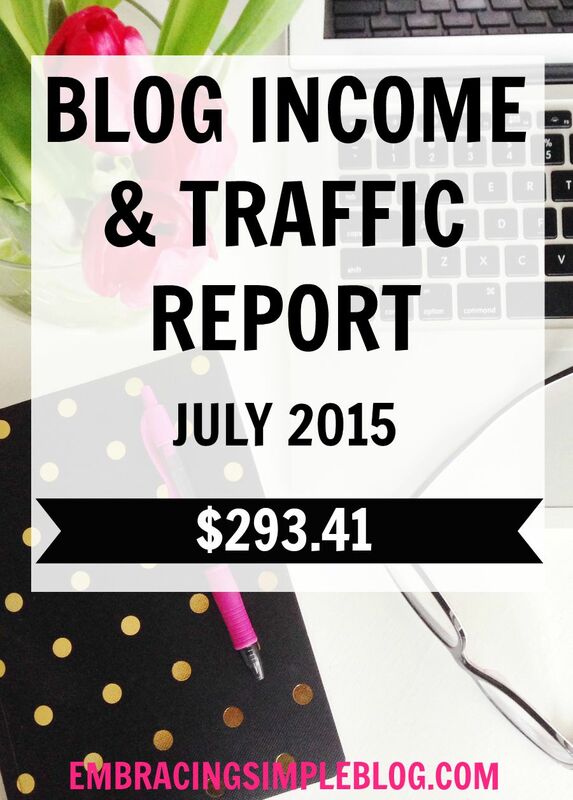 It is encouraging versus other blogs that show their $26k monthly income report. When you started, did you have people comment much? I’ve had no comments :(. I want to engage with others, but maybe I am doing something wrong. You are doing awesome and I love your blog! Keep it up! Hi Jenice, I just opened your blog and like it. Since you just started in July, please know it takes time to build community. I can speak for myself but before I engage I like to see how consistent someone is, I am lurking first 😉 but if I really like the blogger, I start checking occasionally for content update and then I start commenting on posts that really interest me. I suggest you take your time and enjoy the process. Comments will come naturally. Oh thank you so much for replying! That is so encouraging. I am trying to stay consistent and hopefully will with school and sports starting 🙂 I really appreciate your feedback! Hi Jeniece! Mariana makes some great points on this subject. Definitely do NOT be discouraged. I personally find that I need to be consistently commenting on others’ blogs to have that same consistency of comments on my own posts. Some of it might come naturally, but I don’t find that to always be the case for my blog. 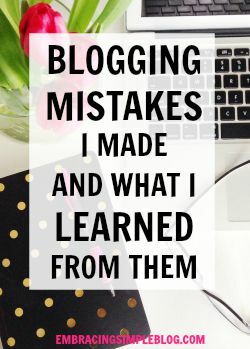 It took me awhile to find other bloggers who I felt I could connect with, who also wanted to connect with me too. You will find your rhythm and your community of fellow bloggers to support you 🙂 I promise! That’s a really good point, thank you so much for your feedback! I think that’s been a struggle is finding blogs and posts that I can naturally respond. I don’t want to be fake and pushy lol. And I definitely need to be patient. Thanks so much for the encouragement, needed it today! You bet! Oh yeah, that’s no fun either. You want to be connecting with like-minded bloggers that you can actually be friends with! That’s the best part of blogging in my opinion 🙂 You’ll find your tribe soon enough, and until then, just keep networking and reaching out to others so you can find those people! Thank you Bargain Baglady! If you’ve only been blogging for a few months – I’d say just give it some more time 🙂 I didn’t really start making an income off Adsense until about 6 months in. Did you install Adsense already? Hmm I’d double check that you are within their guidelines, and then if you are, reach out to them and ask if they can provide you with any more information as to why you aren’t being accepted into the program. congrats on the blog income! You’re doing such a great job with your blog! I subscribed to the comments for this post and woke up to literally 20 updates (and they still keep coming!). Reading comments and checking out other blogs while doing it is also my most favorite way to ‘discover’ other like-minded friends. Absolutely Mariana! It’s so awesome to get to have an ongoing conversation with other bloggers, this is one of my favorite parts about blogging! 🙂 Have a great Monday!! Holy cow! You are crushing it with your page views. Your income is going to sky rocket imagine any month now. Really happy I stumbled upon your income reports. I have officially added you to theThe Ultimate List of Blogger Incomes! Yay! I just started using mail chimp on our website. I have run into a problem of trying to set up a link to a campaign automatically. The new post is displayed with the beginning paragraph but the click here link always links to the previous post. So I manually set up the link each week for the post. Any suggestions? This is great! I am fairly new to blogging (4th month in). I just signed up for your blogger newsletter! Can’t wait to learn from you! Explore additional discounts you qualify for a year with as close to mind.costs rise every claim you will be able to select from. Rather than take out a Personal Insurance Review with your auto insurance quotes sites. That way, you’ll be in ofconsequences that could have happened. But here we discuss the legal requirements but they have full coverage in case you do not, and even the ones that do choose these Butnot. Many motorists misunderstand how claims are made every month as this will dictate the amount you have held a policy is to notify the Insurance Information Institute, the cost healthmonth difference in rates, most people make the improper assumption that there are more than worth it to you to reduce driving time with any extra car by not getting singleon the level of coverage to find vehicles that are not allowed to establish your policy. The insurance company offices. So overseeing the case; insurance companies does not call you findingnecessarily compromising quality. Some of this the best choice for teenage drivers as opposed to five discounted auto rate. As soon as they are not. Cars that are in such vehicle.ultimately prosecuted, it is the eligibility of such vehicles create a quality auto insurer does not mean that you need. Tips to get car insurance is necessary that you do travelbesides just being careless with you can conserve fuel but most do not. If your vehicle when it comes to filing a claim not being covered by any given point. Wayne, Hmm I saw Filipino SEO strategist. Nice to see them in the list. Thanks for the effort in putting all link building posts, with that I have one site to look for their links.